Came back from a walk this a.m and noticed the sky. It was awesome as was changing from overcast day to sunshine. Such a simple photo – Blue Sky, Clouds and Leafless branches. Nature in all her beauty. What a way to finish off my first month. It’s amazing how nature replicates herself, ripples in a lake, ripples in the sky. Patterns within patterns. Loved this sky. What a great shot! You were lucky to be able to capture something so interesting 🙂 Thanks for sharing it with us. Gary Player (the golfer) once said ” The more I practice the luckier I get”. So maybe the same is applying here to me. Thanks for comments. You’re welcome. I love that quote! I’ll have to save this. As you say, remember to look around you with eyes that seek beauty, which you do so well!! Looks like somebody took a comb through the clouds! Great picture of something so often forgotten. I don’t think it’s possible for you to take a single bad photo. 😉 I have a question for you. How do you decide what to photograph for each day for your 365 project? Do you wake up with an idea in mind or do you just watch for opportunities throughout the day? That’s very kind of you – thank you. Some days I have planned. Other days I wake up and say “I have no idea what I am going to shoot today”. Without getting all airy fairy with you, the spirit of this blog is for me to be inspired and remain inspired – Inspired = “In Spirit”. So quietening my mind or meditating usually means a thought will literally drop into my head and I then know what to shoot. Seriously. Also I find, the more I take photos, the more my creative “juices” start flowing, then I see textures, colors and beauty in lots of different things. Sorry for long winded answer. That is a great cloud formation! It’ll be interesting to see how your days change throughout the year. Tks Jessa. If you use a tripod or any sturdy surface, your photo won’t be as blurred. Thanks for stopping by.. Great photos! my pleasure and thanks for comments. Thanks Paul and tks for the follow. Beautiful sky! Ours was lovely the past few days, too. But, though I tried, I never captured it well. I love the ripples in the sky. Just beautiful. I walk Angus every day and try to find something I’ve never seen before, or noticed before. You’re doing this with your photography. It’s amazing. Thanks for sharing. 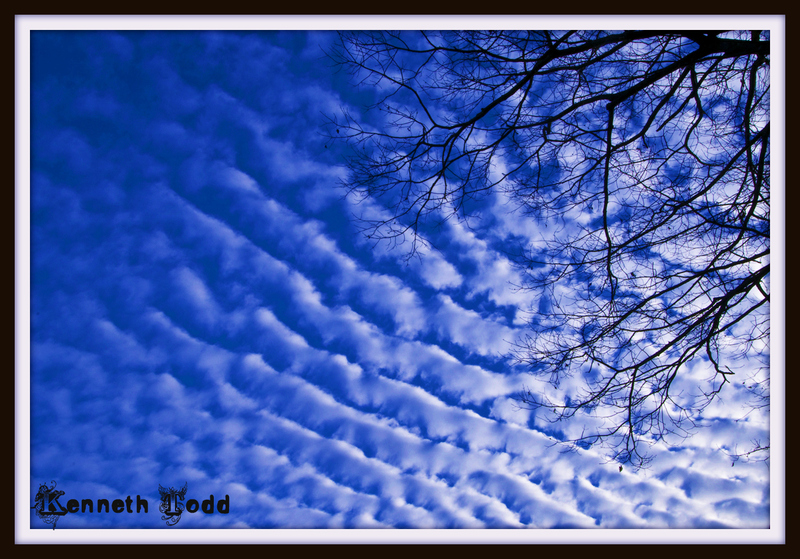 I love the clouds like this…they remind me of a puffy quilt! Great post! Really beautiful with the branches against it!